"I lost my daughter Faith Elizabeth to complex congenital heart disease on August 20, 1997--she was five days old. During my subsequent pregnancy, MORNING LIGHT MINISTRY was a tremendous help to me: providing prayer and a listening ear for my concerns with the next baby. I was also sent lovely mementos in memory of my daughter Faith." "When we lost our baby to miscarriage I was devastated. I searched everywhere for answers and acknowledgement of our loss. MORNING LIGHT MINISTRY provided support within my own faith, support I couldn't find any other place. The gifts sent to me in memory of our baby are something I will always cherish. 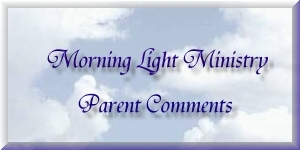 MORNING LIGHT MINISTRY acknowledged our loss, validated my feelings and continues to remember our baby as we do." "Since my baby's death was so sudden, to know there was telephone help was wonderful. It was wonderful to have a contact with someone who had been through a baby death, who could reflect back to me concepts that I had been feeling but had been unable to articulate. It made me feel more grounded mentally and emotionally. The Christian perspective was essentially important to me. MORNING LIGHT MINISTRY has a strong Christian foundation that was missing in other groups. Also, the help from MORNING LIGHT MINISTRY was personalized and non-judgemental." "MORNING LIGHT MINISTRY has given me the spiritual comfort that I could just not find in the secular realm. Since I am a spiritual person secular answers are empty and hollow. Services such as the Prayer Service in the MORNING LIGHT book (which I found to be very helpful) are difficult to obtain elsewhere. MORNING LIGHT MINISTRY picks up where the secular groups leave off. The telephone help is unique and fills in the gap amongst the various self-help methods. The mementos given by MORNING LIGHT MINISTRY and the personal attention given, supercedes any other compassion displayed by any other organization/group so far." "I related to the articles about others' experiences with infertility and miscarriage in the FERTILITY CHALLENGES FROM A CATHOLIC PERSPECTIVE booklet. The crosses sent in memory of my two babies who died through miscarriage proved a thoughtful touch to my life. This compassionate and necessary ministry reaches infertile couples with these and other wonderful resources. May God continue to use MORNING LIGHT MINISTRY to meet the emotional and spiritual needs of those dealing with infertility issues." "It's very touching that there is a ministry that recognizes our grief at the loss of an unborn child whereas most of society doesn't today. It was heartwarming to receive the mementos in memory of our child James Peter." "I received a copy of the MORNING LIGHT book after I experienced two miscarriages. The stories of other women were comforting, but it was this year when another baby died in utero at 4 1/2 months that the book proved invaluable. Despite the deep sorrow we were feeling, but armed with the experience of others and the Prayer Service from the book, we were able to choose the time for delivery of our baby instead of being rushed into anything. We delivered our baby, arranged for cremation and held a private memorial service (for all three of our unborn babies) with the help of our priest. I am especially thankful that the book enabled me to insist that our baby be treated with dignity by the hospital and that gave me the opportunity to see this beautiful creation of God. Having this baby being treated as fully human and recognized by the Church finally brought peace." "It's helped me knowing there is a ministry that can help parents who have lost a baby. From MORNING LIGHT MINISTRY there are many resources available such as information and support, phone calls, a listening ear, to know someone has shared a like experience who I can share with, knowing someone cares and is available anytime." "When people lose a child they don't know who to talk to or where to go for comfort and how to deal with this grieving. The MORNING LIGHT book is a place to find a reference of how to go about grieving in a healthy fashion." "MORNING LIGHT MINISTRY has helped me in ways I could hardly put into words. The telephone support alone was very helpful. It let me express my feelings about my loss with someone who knew exactly what I was going through. The MORNING LIGHT MINISTRY Annual Mass that was held for my babies who died through miscarriage was a way for me to put my children to rest and for that alone I am truly grateful to MORNING LIGHT MINISTRY." "It has been over 32 years since our first son, Michael, died shortly after birth. It was a complete shock, and also didn't get to see or hold him. The funeral took place while I was still in hospital; and most difficult of all, there was no support for us or any acknowledgement that Michael had ever been brought into existence, certainly not from our family members. He was completely ignored. Even the doctor didn't want to explain why he had died. The deep wound has festered in my heart all these years, though I told no one. I truly believe we will be reunited with Michael one day--a soul for all eternity. Thank you MORNING LIGHT MINISTRY so much for the gift of, at last, acknowledgement of our beloved son." "Our daughter Erin was born prematurely at a gestational age of 24 ½ weeks. She lived for only a few hours after birth but touched our hearts forever. It is difficult for others to understand our sadness over this loss. About a year after her birth I was put in touch with MORNING LIGHT MINISTRY and attended the Autumn Series with other bereaved parents. I found there an understanding and empathy beyond words as we shared our stories and our pain. Since that time I have continued to be supported by MORNING LIGHT MINISTRY through the Lending Library, the beautiful Annual Mass and the handcrafted mementos that are part of our home's memories of Erin. Our 6 year old daughter has also benefited from attending the Annual Mass as she meets other bereaved siblings and sees that other families have shared such losses as well. " "I've had three miscarriages each at around 12 weeks in 1986, 1993 and 1995. Life kept on and I was successful in many ways but an emptiness dragged at my heart and soul...By chance I saw the notice for MORNING LIGHT MINISTRY and saw myself needing someone to hear the sadness at the loss of my children. There is little opportunity in our world to acknowledge babies who died by miscarriage. There seemed even less so for a single woman in our Catholic religion-because weren't you supposed to be married? There were just a lot of blank walls and doors, and no way out. MORNING LIGHT MINISTRY gave me a voice and an avenue to acknowledge my sweet children whom I named after my contact with MORNING LIGHT MINISTRY (Lauren Christian, Hazel Marie, Michael Noel), children I would have taken care of as they were God's little ones. I rarely cry about it any more. MORNING LIGHT MINISTRY's acknowledgement has given me some joy when I tell them good morning or good night, believing they are together in God's love." "We believe that the reality of Katie's life in the womb became real to us from our contact with MORNING LIGHT MINISTRY. We became aware of God's care and love for her life. Finally there was a Christian acceptance of this life. This was a healing experience for us both. The beauty and the inclusiveness of the Annual Mass touched us deeply." "I am no longer married and became a Catholic in 1996...It was because my faith had become such a strong guide and support that when I saw a small notice in our local bulletin about the 7 week MORNING LIGHT MINISTRY Series, I called unsure whether my situation would be covered. After all I hadn't lost (to use the words of the notice) a baby. I had just had two miscarriages and an ectopic pregnancy. I knew the Church's belief was that life began at conception but these weren't really babies after all. That's what I had been told. That's what I told myself for 14 years...But not now. My participation in the Series changed that way of thinking...I told you that MORNING LIGHT MINISTRY was a marvelous gift. MORNING LIGHT MINISTRY actually gave me many gifts. Most importantly, MORNING LIGHT MINISTRY gave me my babies. The out and out dismissive nature of everyone from my doctors to my husband...refuse to recognize my babies...The focus was on the failure to succeed in being pregnant not that a human being had been conceived and was now gone to the Father...Not only did MORNING LIGHT MINISTRY recognize and acknowledge my babies but it helped me to remember them and to honour them. MORNING LIGHT MINISTRY gave me mementos to remember and honour my babies. Due to the early loss and lack of recognition of my babies I didn't have anything that I could look at or hold to remember them...all mementos to cherish and hold my babies near in faith each day...MORNING LIGHT MINISTRY gave me validation as a mother. It wasn't that I didn't have children, I didn't have any surviving children. MORNING LIGHT MINISTRY gave me healing. I could acknowledge my babies even though they weren't here for long. I could acknowledge my love for them...Just because I can't show you a picture of my babies' faces, just because my babies don't have names (I have not chosen names yet), my loss is no less important. The Annual Memorial Mass was such a wonderful experience of this and of spiritual healing...I urge you to share MORNING LIGHT MINISTRY with your parishioners. Don't let one of your parishioners carry this buried inside of them for 14 years. Allow these people to be freed from the binds of grief...When everyone else is saying, 'It's not a big deal', MORNING LIGHT MINISTRY through sharing, mutual comfort, guidance, acknowledgement and prayer says it's okay if it is. Please share this gift." "I lost five babies many years ago always at 6 months gestation. MORNING LIGHT MINISTRY enabled me to bring Light and Love into my heart where there had been buried pain for 30 years. The Love I experienced at MORNING LIGHT MINISTRY moved the pain that I was holding into the Light. MORNING LIGHT MINISTRY clarified for me the relationship between God and grieving and brought me Peace." "We heard about MORNING LIGHT MINISTRY from our midwife in 1998 who left the MORNING LIGHT MINISTRY brochure with us at the most traumatic time in our lives after an adverse prenatal diagnosis. At the time I put the brochure away thinking-I'm not going to need a group like this! It was in thinking back, a coping mechanism hoping all would be alright! At this point you are going through many emotions. You are going through the grieving process even before your baby is born and still you are desperately hoping all will be well. Since that time I've read the HOPE IN TURMOIL booklet. I would have appreciated having it available to me at the time because I was desperately wanting to hear other stories of how people coped who brought their babies to term with a fatal condition. Our baby Joseph was stillborn. I received the MORNING LIGHT book from the Funeral Home. We found it helpful in reinforcing our need to plan a proper good-bye. We used parts of the MORNING LIGHT book's Prayer Service for different parts of the Mass. Our children wrote good-bye letters to Joseph and picked a special toy to go in the casket-all suggestions that we got from the MORNING LIGHT book." "MORNING LIGHT MINISTRY has helped the Catholic Church to finally recognize a need for bereaved parents to come to a place and share their grief and faith in one. They have an annual Mass that celebrates the lives and the loss of our children. This Mass has so much meaning spiritually, it truly fulfills me. MORNING LIGHT MINISTRY is a place that is filled with God's love for us to come together and be there for one another through our grief journey." husband and I were practising Catholics I was hungry for spiritual healing as well. We felt so alone with our grief and I truly felt that people didn't understand the loneliness and sadness that we felt as parents. We had also suffered a miscarriage just before my pregnancy with Ann and a miscarriage one and a half years later. It was such a bleak time for us and I was desperate to contact others in similar situations. I felt very isolated. We also felt that God had forsaken us and it was a long time before I retained my relationship with God. We were then blessed with three wonderful sons. They know that they have a sister and we do visit her grave as it is located behind the church that we attend in D., Ontario." "I went to a priest for some spiritual guidance after my miscarriage in November, 1999. He referred my phone number to MORNING LIGHT MINISTRY with my permission. Upon my first conversation with Bernadette she made me feel comfortable. As we talked she made me feel a little bit better about myself and what I had been through. I was afraid of getting more deeply depressed than what I already was experiencing, as I have a surviving child and a husband to care for. If it weren't for Bernadette's kindness and soft encouraging words, I would have been driven deeper into my depression. She invited my husband and myself to attend MORNING LIGHT MINISTRY monthly meetings where there would be others who have suffered a loss of a child. This helped me the most because I really didn't want to be around others much because all I had been doing lately was crying. I had felt a little relieved to know and see others that had been through a similar situation as we had. The information that was given to Rob and I was so helpful and needed. The music that Bernadette had chosen for the topics that we were discussing were so sweet as well as uplifting (to a point since some of the music was sad but they fit the topic at hand). Bernadette did a lot of things out of the kindness of her heart and to help others in need. MORNING LIGHT MINISTRY sent numerous items to us in memory of our child we lost which has helped us in a way that we can put a kind of closure/memory to our baby. We won't ever forget about our baby but in the whole picture we don't want to stay focusing on what happened and the awful feelings we were feeling about losing her. It is really hard for me to put in words how MORNING LIGHT MINISTRY has helped my family and myself. All I know is that deep in my heart and soul I truly thank Bernadette and the beautiful ministry that has helped me to survive one of the most difficult times in my life, losing a baby." "We found MORNING LIGHT MINISTRY to be tremendously helpful to us once we received the fatal diagnosis for the baby I was carrying. With the help of MORNING LIGHT MINISTRY we were able to prepare for the birth and death of our son in almost every way. From the HOPE IN TURMOIL booklet we were able to be reassured by other families stories and connect with a family through a resource group listed in the booklet whose baby had exactly the same fatal condition as our son. We were, on a practical level, able to make the necessary arrangements regarding his birth (Baptism, having pictures taken, handprints & footprints, holding and talking to our son) and death (funeral and burial arrangements etc.). On a spiritual level we were encouraged to pray and trust that the Lord did not 'do this' to our son, but that the Lord has a unique plan for all of us. The ongoing telephone support and the written resources available to us helped make our baby's birth and death the most positive experience possible, in that we were able to prepare (as much as we were able) for his birth and death, and we are very much at peace with our decisions with the help of MORNING LIGHT MINISTRY. We are grateful to MORNING LIGHT MINISTRY for being there for us through such a difficult trial." "I find that the book MORNING LIGHT is really from a Christian perspective rather than just a Catholic perspective. 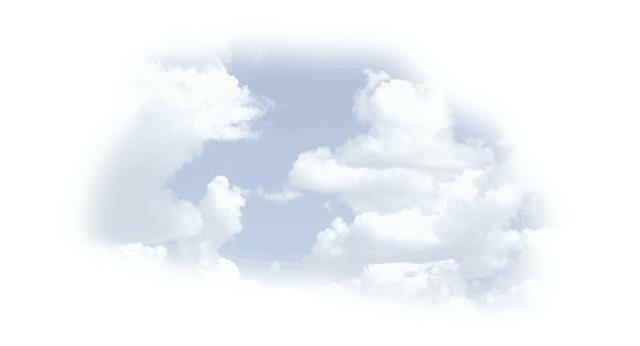 It deals with the raw emotions and spiritual confusion of bereaved parents in a very honest and real way. I personally found it enhanced my spiritual journey. Even though it's been several years since the death of my son, I found it comforting and helpful to re-visit the Old Testament references to baby loss. I found the suggestion of using lamentation as a form of prayer to be an exciting idea." "I found the MORNING LIGHT book to be a perfect combination of religious support, helpful information and personal stories that continue to help me through the many rough days and help calm my sense of isolation. Bernadette Zambri has written a 'personal friend' for each of us who have lost a child so we don't have to journey alone." "MORNING LIGHT MINISTRY gave me an opportunity to set aside some time from my busy schedule to reflect on our lost babies in a caring, prayerful environment. We shared a bond of love for our babies whose fleeting lives took a firm emotional hold on our hearts." "Even though I didn't attend a MORNING LIGHT MINISTRY meeting, knowing the help was available meant a lot to me. The ministry was particularly helpful in providing me with further resources in my subsequent pregnancy." "I felt that the monthly support group and the 7 week Series of MORNING LIGHT MINISTRY were very good learning experiences especially from the husband's point of view in order to understand the grieving process of his wife. It also helped me to understand my own grieving process. I got to understand other couples' experiences regarding the uniqueness of their babies and the events surrounding their babies' deaths. Also, I became aware that each couple grieves differently." "The death of my babies due to miscarriage has been devastating. I am grateful that love, support and compassion from MORNING LIGHT MINISTRY are only a phone call away." "After losing our baby boy with anencephaly whose life was not valued by anyone, I felt like I was travelling on a very lonely road. Then, one day in September, 1996, I got a phone call from Bernadette at MORNING LIGHT MINISTRY. She immediately expressed that she valued my son's life. What a blessing it was to know that Bernadette and other parents at the monthly support group and the Series could better understand my loss because they all had experienced the loss of their babies who are all now in heaven." "Five months after Sara's death, the 7 week Series gave us a great opportunity to unite together to listen, share, and connect in a spiritual way. Understanding and expressing my sorrow and grief, within the context of my Catholic faith was very important to me. MORNING LIGHT MINISTRY's spirituality of unity and love has helped me find the Peace of Christ. Praise God!" "I am a bereaved mother who is experiencing difficulty in conceiving other children. I found the FERTILITY CHALLENGES FROM A CATHOLIC PERSPECTIVE booklet very interesting and informative, but most of all that there are places to go and resources from a Christian perspective. Reading the stories of other couples relieved the feeling of isolation that I had experienced previously." "MORNING LIGHT MINISTRY has helped me in many ways with my journey back to God after losing my three week old son. Whenever I needed to talk, help was just a phone call away. The many conversations helped me realize I was not alone in my anger towards God, and that lamenting was indeed a form of prayer. Two years after I lost my son, I still felt very disconnected to the Church and God. Attending the MORNING LIGHT MINISTRY Autumn Series and Annual Mass has helped me restore my faith." "When I had the first miscarriage I was 10 1/2 weeks pregnant and we were on vacation. My husband called in a priest (not mentioning the age of our baby) . When the priest did come he said, 'I don't usually come when the baby's this young.' It made me feel that my loss was less significant because of my baby's age. With my second miscarriage everyone's expectations were for us to get on with our lives and so I never grieved. With MORNING LIGHT MINISTRY (the Series and the Annual Mass) I was finally able to grieve the loss of my two babies, receive acknowledgement for their lives and reaffirm that all life begins at conception. It allowed me to question and eventually this strengthened my faith." "If I can articulate the difference between MORNING LIGHT MINISTRY and other groups that offered assistance it is the personal aspect-it truly felt like a person reaching out to you in understanding and compassion. MORNING LIGHT MINISTRY is founded in Christ unlike other groups. MORNING LIGHT MINISTRY has a true appreciation of Derek's life."